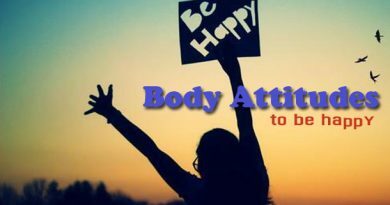 విద్య, వైద్యం.. ఇక జగన్‌ గెలుపేనా..! On the celebration of Republic day, Regional airline services company Megha Turbo Airways has given an opportunity to orphans to fly over clouds. 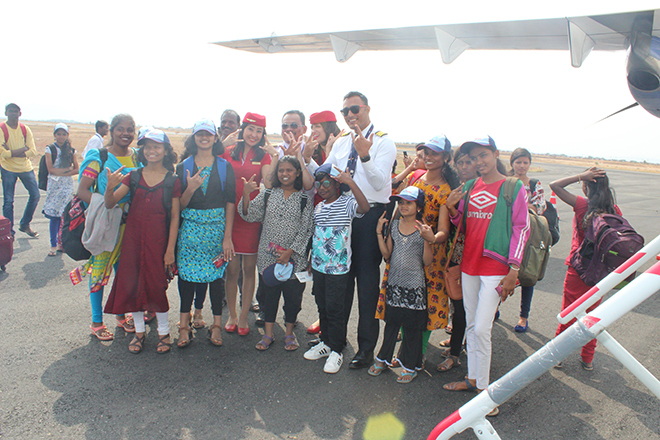 TruJet aircraft took off with the orphan children at 9.15 am to Kadapa. 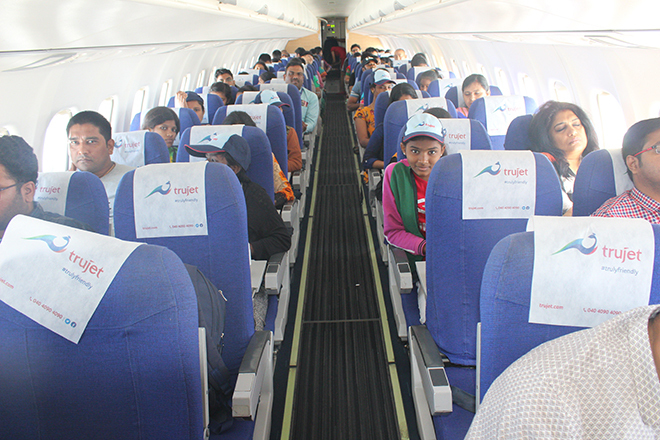 TruJet has come up with a program, “Wings of Hope” to boost the morale of children since the last year. With the association of Ashrita Foundation of Charminar and Rainbow foundation of Gajularamaram, TruJet arranged free air travel to 30 orphan children to Kadapa and has taken them to various tourist places free of cost. The children were eager to enter the aircraft. While the aircraft was taking off and was lifting into the air, the children, in their excitement screamed ’amazing’. As they peeped out of the aircraft window, they expressed their joy. Vaishnavi, a ninth standard student expressed that her dream of taking a flight at least once during her lifetime was realised through TruJet. Another student, Durgadevi expressed that it was an awesome experience, and that she wasn’t scared travelling in the aircraft. Fourth standard Noel expressed that since it was his first experience, he was slightly scared but then when the flight took off into the sky; he felt it was a great experience. TruJet organized special vehicles to visit important Tourist Places in Cudappah. Initially, they visited Pushpagiri and then Gandikota. Children expressed their enthusiasm to visit Gandikota. Later they visited Dargah in Kadapa. Trujet had taken care of Flight charges, facilities for food and accommodation along with a visit to all tourist places. Trujet’s mission is to provide such visits to 300 students under the scheme, “wings of hope”.With the help of Valmiki foundation, it had already facilitated such a visit to 40 orphan students to Hampi in Karnataka. 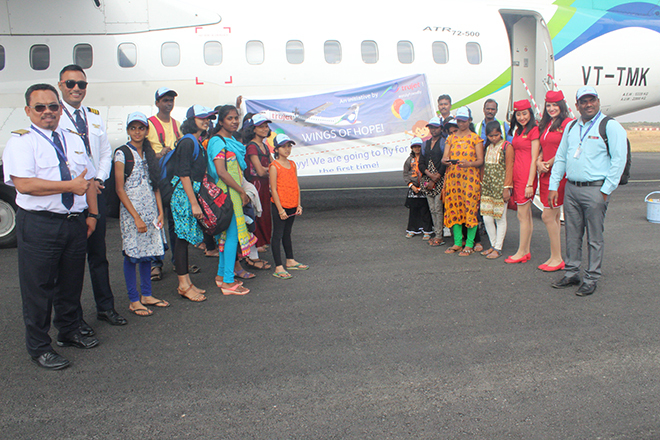 Last year, during Children’s Day celebrations, TruJet had facilitated an educational tour to 40 students of SRV School in Tamilnadu from Chennai to Salem.Also last year, during Kerala floods, TruJet provided its free services for three days, taking the flood victims from Tiruvananthapuram to Chennai and relief material from Chennai. Trujet is going launch service to Nasik and Indore from February 13th. TruJet is already running services to Porbandar and Jaisalmer. Ahmedabad is the second base station for TruJet. TruJet with 5 aircraft operating 17 routes. Trujet operating its services to Hyderabad, Chennai, Mumbai, Goa, Aurangabad, Salem, Mysore, Bellary, Tirupathi, Rajahmundry, Kadapa, Vidyanagar, Nanded. TruJet is the only service provider to Aurangabad. Copyright © 2019 Just Ippude. All rights reserved.